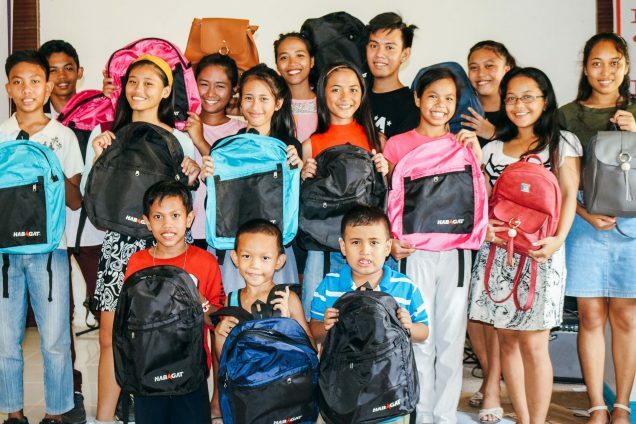 Photo: These children at our Cebu Hope Center were happy to receive new backpacks for their new semester at school. Today we share the good news that the 49 children (ages 5-18) — including the girls living in the Girls Home, our field director’s children, and the other children enrolled in our Children’s Hope Center on the island of Cebu — started back to school on June 4th. This semester the children are studying English, science, math, social studies, their native Filipino language, music, art, physical education, health, religion, and woodworking and other trade skills in school. In addition to education and nutrition support, our Children’s Hope Center program model also includes a VBS-style outreach program on Saturdays with Bible study and singing songs, and fun games such as sack races, tug-of-war, volleyball, and badminton. Along with our Cebu Hope Center, we started a new VBS outreach program in 3 areas of a mountainous region — Camboang Dumanjug, Bitoon, Dumanjug, and Liong Dumanjug — and the enrollment has recently increased to 394 children. We offer all of these children nutritious fresh-cooked meals, juice, chocolate porridge, and hygiene items such as soap, shampoo, conditioner, toothbrushes, toothpaste, baby powder, and Kleenex. We are also happy to report that thanks again to your support, we were able to install 7 tall security lamps down the main driveway leading to and from our main campus in May. The main driveway approaching our campus was previously very dark and we felt it was dangerous for our children when leaving to walk home from the after-school care program. So to avoid any dangerous incidents, we desperately needed the security lighting. Now the children feel safe and secure, and they are very thankful. In May we repaired the small secondary pond structure at our fishery — it previously had suffered many cracks and we were not able to contain water or fish in the structure. Our native team will soon secure the repaired pond structure with a waterproofing agent, and then fill the pond with water and fish a month later when the waterproofing agent is completely dry and sealed and will not contaminate the water or the fish. In other good news, our hen house project continues to operate successfully, an important part of our farmland enterprise. We currently have 215 hens and egg production is at optimal levels — our hens are currently laying an average of 150-175 eggs per day. There is such a high demand for fresh eggs from local neighbors that our native team has been selling them on a wait listed basis directly to the consumers every day, which is currently bringing us an average profit of $80 per week. Furthermore, we sold 3 goats at market in February, and we sold 2 more goats this month, which gave us a total profit of $213. We currently have 10 goats living at our goat farm which will bring us more profit in the future. We also recently sold 4 of our pigs at market which provided a good profit of over $300. We will soon be purchasing 6-12 new pigs to live in our piggery and sell in the future. Along with your faithful support, our farmland projects help with some of our funding challenges, providing more profits to help at-risk children and orphans succeed in school. Our coconut grove contains 85 mature coconut trees, but we have 115 coconut trees total, including 30 new coconut trees which we planted in 2016 — the new coconut trees will mature in 6 years. The younger coconuts are used in the children’s diets — after the nuts are opened, the soft sweet meat is delicious to eat, and the juice is refreshing. We harvest an average of 300 coconuts per month, which yields approximately $22 monthly. We are looking forward to another bountiful coconut harvest in July. Our banana grove continues to flourish with 103 trees which are harvested weekly — we harvest about 5-6 large bunches of bananas per week, which gives us an average weekly profit of $28. Our profits from banana sales quickly add up since we harvest bananas every week. Also, this nutritional staple in our children’s diets provides them with a good source of potassium as well as other nutrients. We look forward to another great banana harvest in July. We are so thankful for your prayers and support which enable us to continue to bless and transform the lives of our children and to break the tragic cycle of poverty.